Anila Quayyum Agha, born in Lahore, Pakistan, lives and works in the United States of America. She did her bachelor’s in Fine Arts, from the National College of Arts, in 1989 and her MFA degree in Fiber Arts from the University of North Texas in 2004. 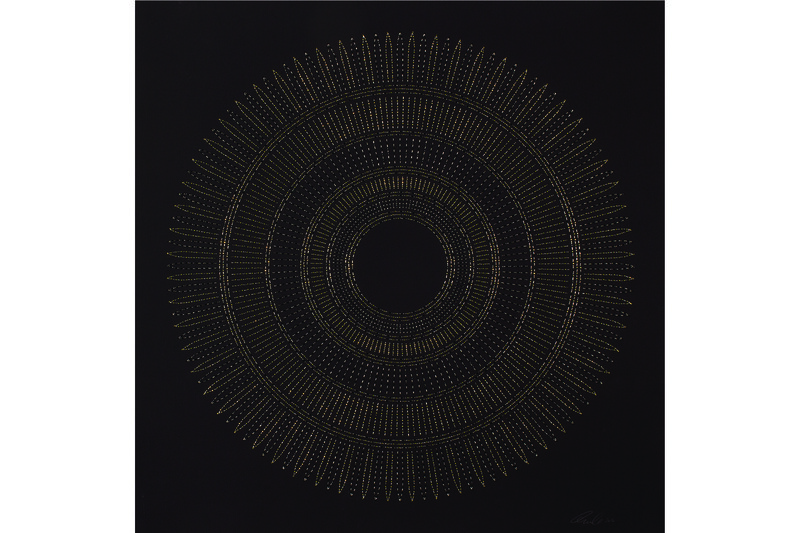 With Seventeen solo shows, and fifty group shows, Agha, has won many awards amongst which the most notable ones being the ArtPrize, 2014, at the Grand Rapids, Michigan, and the second just recent Cincinnati Art Museum, Schiele Prize 2017. Following is a conversation with Agha unraveling the artist, her artworks, and her life. Sana Kazi: “Intersections,” is one of your most famous works that won the Public Grand and the Juried Grand Prize in 2014 in Grand Rapids. It is an interpretation of the motives and patterns from the Alhambra, talking about western and Islamic discourse and co-existence. Would you elaborate on this work, its relevance, and importance in context to Pakistan? Would you consider bringing this body of work to Lahore to inculcate the absolute resolution to differences that are so prominently experienced here? 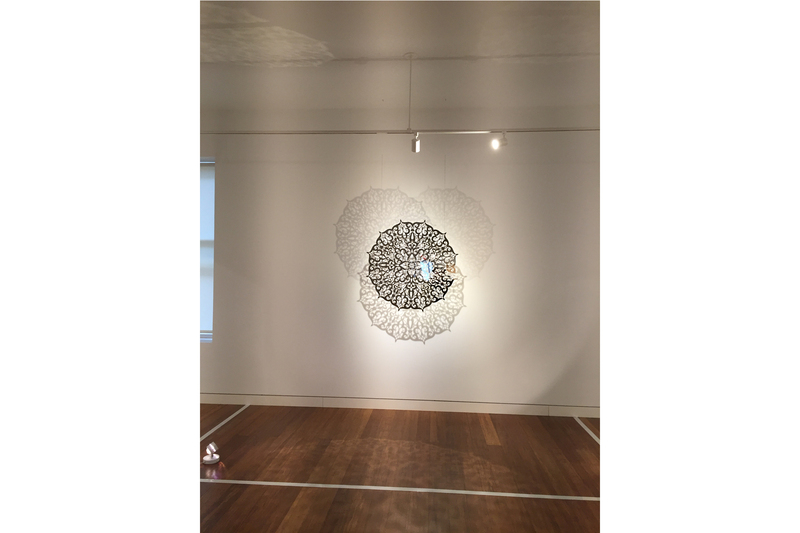 Anila Qayyum Agha: In the ‘Intersections’ project, a large sculptural installation I explored the geometrical patterning in Islamic sacred spaces to reveal its fluidity. I wanted to invite the viewer to confront the contradictory nature of all intersections, while simultaneously exploring boundaries. For this, and the subsequent light projects my goal was to explore the binaries of public and private, light and shadow, and static and dynamic by relying on the purity and inner symmetry of geometric design, and the interpretation of the cast shadows. In the city of Lahore, where I grew up, the mosque was not only a place of worship, but also the repository of the public art form. During my teenage years Pakistan didn’t have many museums or libraries for public consumption to increase literacy or cultural knowledge. I believe Mosques then and possibly even now served the additional purpose of providing the much-needed cultural education and experiences for its male population. Thousands of beautiful mosques were spread all over Pakistan. But like the millions of women in Lahore where I lived, there was no space for me in those mosques, the dictates of culture relegating us all to praying at home. It is this seminal experience of being excluded from a space of community and creativity that resonated with me when I visited Moorish Spain and experienced the historic site of the Alhambra. And to my amazement discovered the complex expressions of both wonder and exclusion that have been my experience while growing up in Pakistan. 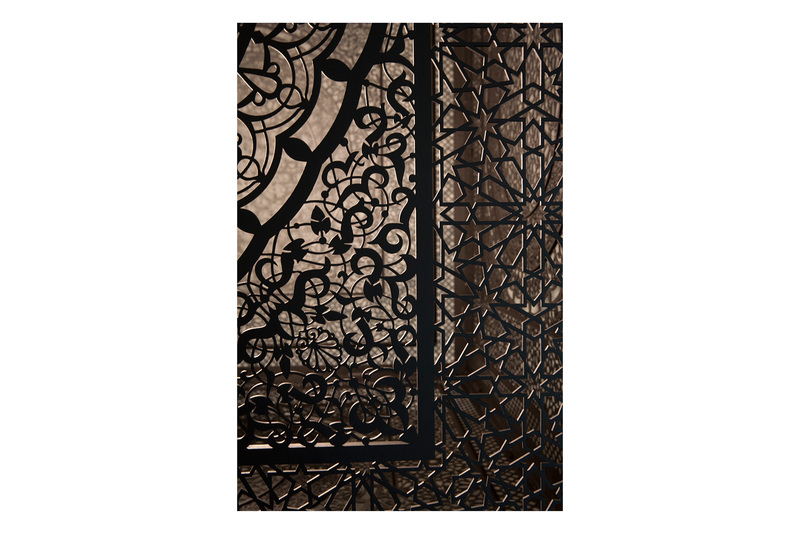 ‘Intersections’ emulates patterns from the Alhambra, which was poised at the intersection of history, culture and art and was a place where Islamic and Western discourses, met and co-existed in harmony and served as a testament to the symbiosis of difference. 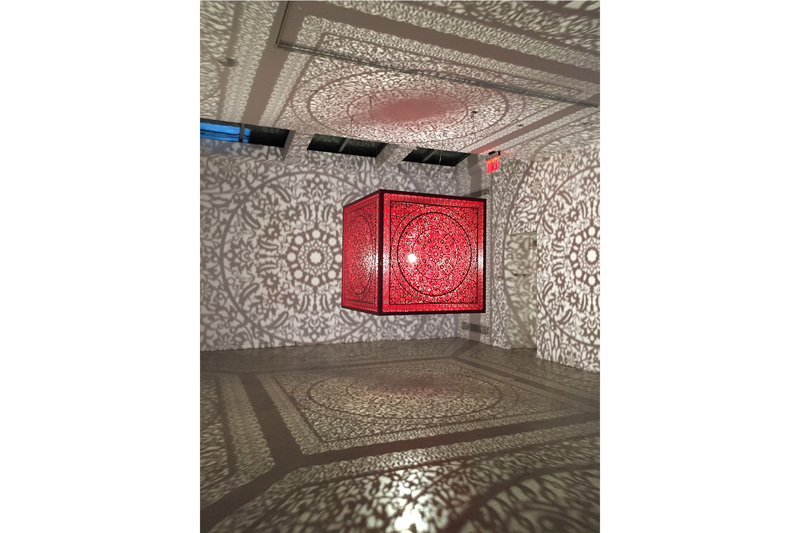 Cumulatively, this installation uses light, and pattern along with the palpability of reflection to question the assumptions of geometric design as a form opposite to representational or figurative art. The source of this question lies at the crux of Islamic art, which used the geometric form as an example of the pure and transcendent, as opposed to the organic and human. The clean and definite lines and their avowed distance from figurative nature of idolatry aim literally to direct spiritual consciousness away from the ambiguity and corruption of the lived form into the certitude of purity. 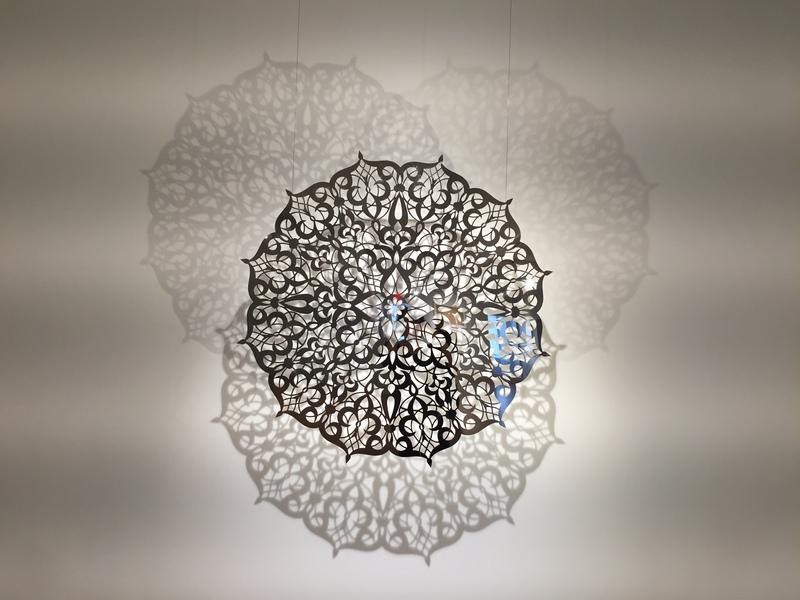 In exploring the interpretive capacities of the geometric motif, I question this dichotomy that lies at the center of Islamic art and its departure from the human form. In addition to questioning the assumptions behind the geometric or non-figurative form as certain and static, this piece also provokes an investigation into questions of authenticity, which are central to the post-colonial condition. The intertwining of light and shadow, original and derivative, are at the core of the various renditions of the pattern. They mirror the post-colonial quest for originality and purity, an ultimately circular geometric pursuit where primary form can only be imagined and never really captured. In a contextual milieu where difference and divergence dominate most conversations about the intersection of civilization, my work explores the presence of harmonies that do not ignore the shadows, ambiguities and dark spaces between them but rather explore them in novel and unexpected ways. I endeavor to make artwork that is deeply layered, yielding multiple meanings and experiences. 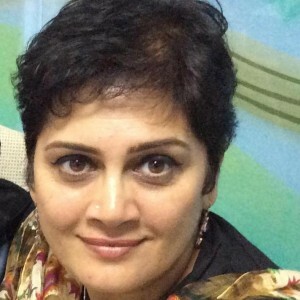 My personal history and memories of growing up in Pakistan as a woman are a part of my narrative. I want to continue the examination of exclusionary politics, shifting identities within culture/s, and public & private spaces. We live in very divisive times with social and political issues resulting from multiple wars, mass exodus of refugees/ immigrants, and racial/social misunderstandings. These are very topical subjects connected to the political and social environment of world. Through my artistic practice my intent is to touch upon the burning issues of our times and to create dialog and influence a broader audience. I will be honored to show my artwork in Pakistan. SK: Would you explain the design and concept behind “Walking in my mother’s shadow,” solo show 2016 in New York in reference to your own visit back home and on a broader horizon, the dilemmas of displacement and war? AQA: Celebration and loss of loved ones or sites of identity and our memories of them manifest in several ways. Often, we experience a spectrum of emotion, beginning with deep joy, or sorrow, turning to quiet acceptance over time. Walking in My Mothers Shadow dealt with my personal feelings of longings, sadness, loss, and also joy. Through this work I reflected on the complexities of love, loss and gains I have experienced over the past many years. The artwork in the exhibit also attested to losses and gains experienced and endured by people across the world for many reasons, such as war, oppression and censorship. In early 2016, I had just returned to the United States from Lahore, Pakistan when I received the dreaded phone call that every immigrant fears; my mother had died. I had just seen her, touched her, talked to her and now she was no more. I had been in Lahore to attend my son’s wedding and my moments with my mother had been short and snatched, sandwiched between the rituals and celebrations of the wedding. As is the custom in Islam, she was buried within a day of her passing. There was no question of going back to Pakistan; she was gone. And I had to mourn her alone without my siblings to share the burden. The artworks in that exhibition were borne of the varied mix of emotion that followed my son’s wedding and my mother’s passing. On a larger level, it was the communal sense of loss – of loved ones, identities, homes and countries – experienced by myriad people across a world ravaged by the atrocities of war and displacement that created equivalence. It added poignancy to my personal loss and the global loss I bear witness to daily via the news media. Much of the work in the show also reflected my joy for my son and his future life alongside of the lives of many people across the world who have been given second chances through resettlement in new lands but who will always carry with them a sense of loss, of displacement. The artwork dealt with the interplay of presumed opposites: male and female, the definite and the amorphous, the geometric and the organic. In that body of work, my concerns emerged in an exploration of joy and grief, the nuptial and the funereal, the seen and the unseen. Through those works I wanted to draw attention to the overarching themes that hover in the background, i.e. connecting the cultural accumulation of gendered norms that govern women’s lives limiting selfactualization through both the wedding and death. Within those works I examined the amoebic transparency of sorrow, and its ability to reflect and inflict light and darkness. I worked with materials that are transparent or ethereal, that inhabit the limbo of loss, a space between visibility and invisibility, reality and unreality, light and shadow, real and unreal. The materials appear fragile, but are often resilient, hardy, even stubborn just like sorrow when cut, pushed, pulled, scraped, or sewn together. 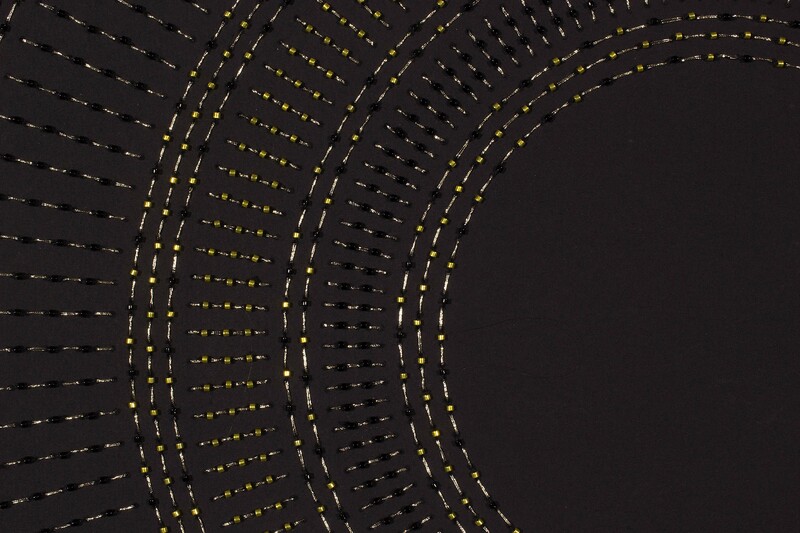 Materials such as steel cut with delicate patterns, or embroidery and beads on white, black and brown paper, reflected and refracted light. They represented space that belongs to one more than the other, evaluated the color of my body and the bodies of others, and the cycles of life and death. In the floral beauty of the patterns and layers, the cuts and embroidery strived to capture the identity, beauty, and femininity of my mother and other mothers – me, you, us – that become obscured by gravestone and shroud. The patterns paid homage to the organic to which death is inevitably linked but from which new life also emerges. The colored metallic embroidery threads in those works are often used in women’s wedding dresses in Pakistan but never for shrouds. In stitching these threads into paper, and cutting patterns in steel, I connected the wedding that is believed the beginning of a woman’s life-giving journey, and the funeral that is its ultimate end. The interplay of the nuptial and the funereal invites us to cherish our losses, more so because they are intrinsically connected to life’s most beautiful moments such as holding a hand that may soon be no more. Together, the wedding and funeral suggested the larger cycle of life binding us through gossamer fragility and beauty of a bloom that will undoubtedly fade. SK: “All the flowers are for me,” (Red) won the Cincinnati Art Museum Schiele Prize. What is the meaning behind the title of this work, and the meaning “red” in your opinion? AQA: Inner worlds, the worlds of memories and stories have often belonged to women. In days past, before the city forced people into smaller and smaller spaces, the women were also the caretakers of gardens, whose blooms and blossoms, scented their tales and created an ongoing dialogue with the natural. Seclusion then, did not, as it does now, mean an estrangement from nature. Enforced both by the constriction of public space, by the encroachment of religious dogma and the amoebic conquest of the unnatural, the seclusion of the individual woman is imagined as a cessation of her relationship with the natural. But the meaning of woman is the essence of rebirth and reclamation. The dead gardens of times past, the inflection of leaves, the curves of a tendril are recaptured in the art of inner chambers of the Islamic world; appearing on walls, in the hems of embroidered garments and in the silken weave of carpets. Together they become a reclamation of the natural for the inner world of women; a testament that seclusion is not a severing of the beautiful. The natural garden then, is transformed and reformed into an eternal garden, whose blooms do not die, and whose expression is wholly feminine. It also challenges the dominant representations of seclusion, of private space and inner life as somehow lesser and lacking in beauty and versatility. In the reclamation of natural beauty, in its recreation, hence is a testament to the versatility of the female imagination, the essentially feminine quality of creation that undergirds women’s lives. It also provokes the viewer into a reconsideration of the value of the private and the secluded, not as something less, but as something more. In this second sense, it represents a revelation; that there can be beauty, enchantment, laughter and joy in unexpected and unknown spaces. 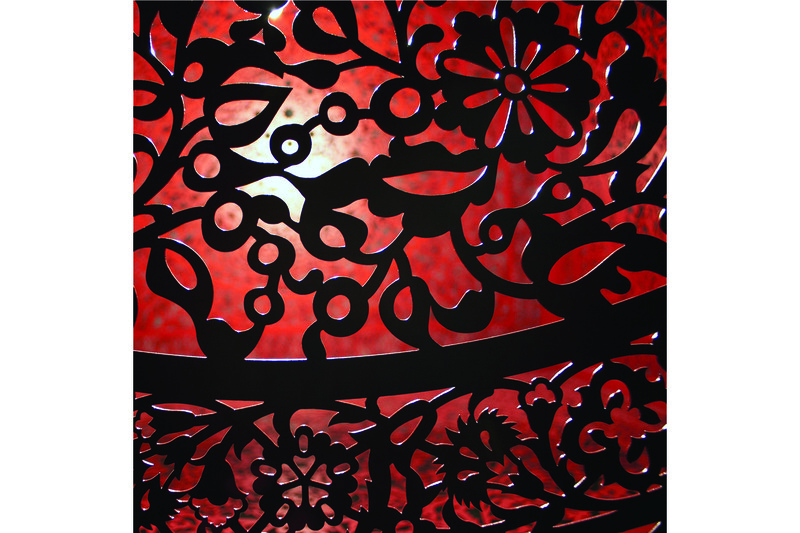 All ‘The Flowers Are For Me’, thus celebrates women and their resilience, and the color red references the colors used in Islamic art and architecture, but also represents the passion and violence women live with daily. SK: How does your teaching career effect you as an artist, or vice versa? AQA: Art and culture in my opinion is the heart of any community; and that education in the arts helps train compassionate, self-aware civic-minded people. I further believe teaching is a noble profession providing an important service for the world community and I for one am intensely committed to teaching and helping train our future generations. Teaching is an extension of my own creative practice and life experiences both here in the United States and in my native country, Pakistan. I teach because I am an eternal student myself and have a tremendous respect and love for learning. Teaching is also my way to purposefully give back to my community through the provision of critical thinking skills that ensure students’ make informed choices for their lives and futures. Art is a valuable though difficult undertaking that brings both extraordinary rewards and challenges. Deep commitment is required to make it a way of life for art practitioners. I have striven to distinguish myself as an artist-teacher capable of interacting with complex communities working toward common goals. Living and working in Indianapolis has been good for me. It’s a small city in the mid-west of the United States and is often in the shadow of Chicago which is one of the biggest metropolis’ in the country. However, since there is not as much to do here like there is in New York City, I work more in my studio which allows for more time to conceive, create, make mistakes and rectify those mistakes without anyone being the wiser. The faculty and staff at Herron School of Art and Design at Indiana University welcomed me when I relocated to Indianapolis in 2008. Becoming a part of the larger community within Indianapolis and the state allowed me to contribute in meaningful ways through teaching and working within the arts community. I feel it is my responsibility to teach tolerance and familiarize my students to a larger world outside their purview. A large percentage of the students at IUPUI may be first generation college students and come with pre-conceived ideas of race and religious affiliations but may graduate with a more compassionate world view. I myself live by these tenets I teach my students, and ultimately this circular pursuit of tolerance and racial/ social justice affects my own work positively. SK: Tell us a bit about the various materials you use for your work? AQA: As a cross-disciplinary artist I create mixed media drawings and sculptural installations. Through the use of a variety of media, from large sculptural installations to embroidered drawings I explore the deeply entwined political relationships between gender, culture, religion, labor and social codes. In my work, I use combinations of textile processes along with sculptural methodologies to reveal and question the gendering of textile/feminine work as inherently domesticated and excluded from being considered an art form. My experiences in my native country and as an immigrant here in the United States are woven into my work of redefining and rewriting women’s handiwork as a poignant form of creative expression. 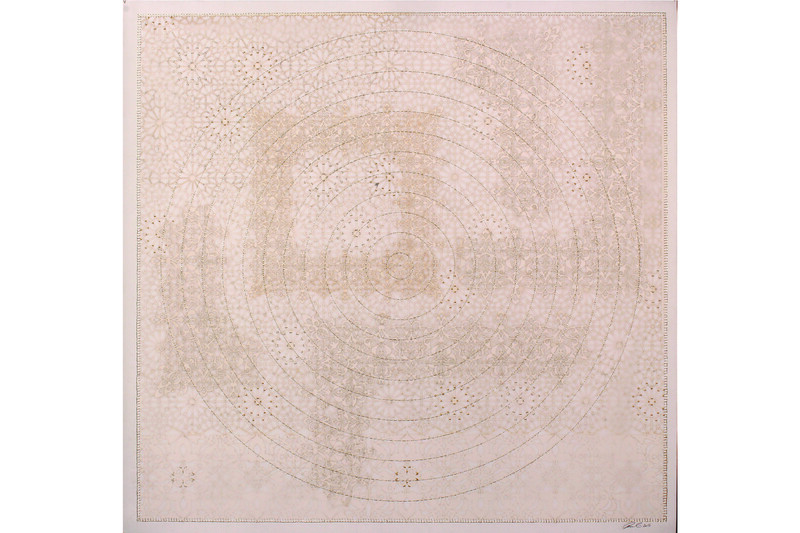 Using materials such as steel and wood in my sculptural works to show delicacy and lightness, or embroidery as a drawing medium in my drawings I reveal the multiple layers resulting from the interaction of concept and process and to bridge the gap between modern materials and historical patterns of traditional oppression and domestic servitude. I have continued to add to my original concerns within my art practice by exploring complexity through additional media, processes and technology, producing more complicated weaves of thought, artistic action and social experience. My work is not about Islam or Christianity, but a contemplation on the nature of boundaries and alienation, and on the power of dialogue to transcend the barriers of gender, race, religion, and culture that prevent the true intersections and exchanges between cultures. The conceptual ambiguity of the resulting patterns in the artwork, create an interactive experience in which the onlooker’s subjective experiences of alienation and belonging become part of the piece and its identity. My fascination with commemorative architecture has added another layer to my work. 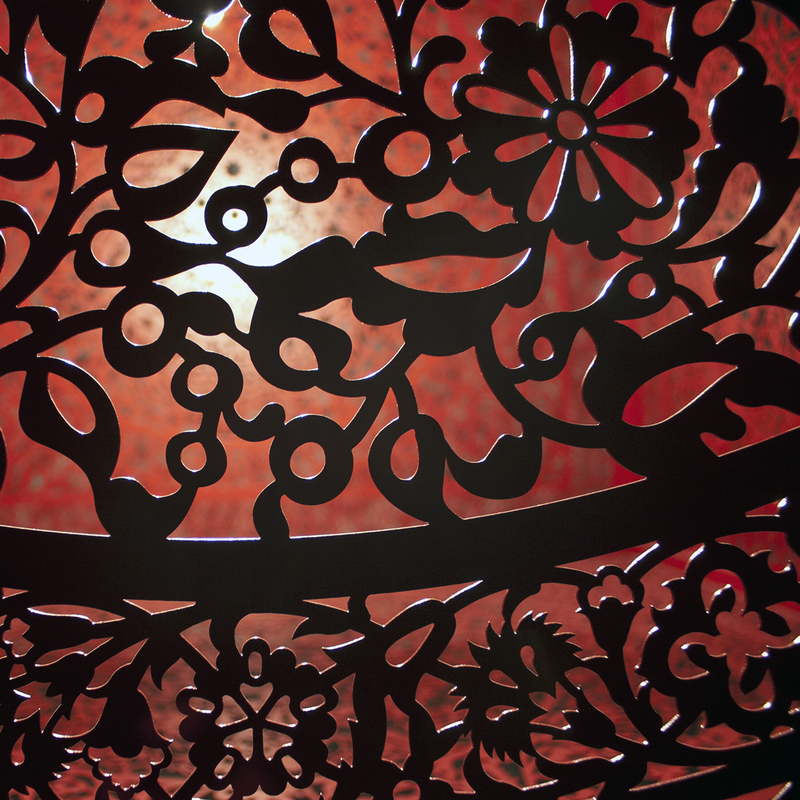 In South Asian and the Middle-Eastern interiors of mosques, homes, and the walls of gardens are often constructed with elaborately cutout screens. The patterns in these architectural constructions filter light and allow air to pass through—effective strategies in dealing with the heat and bright sunlight of the region/s. I have chosen to integrate these architectural elements into my artwork to add conceptual and metaphorical weight and meaning to both my drawings and installations. These integrations add complexity by introducing size, scale, and pattern to the artwork. I work with materials that are often transparent or ethereal, that inhabit the limbo of loss, a space between visibility and invisibility, reality and unreality, light and shadow, real and unreal. The material choices appear fragile, but are often resilient, hardy, even stubborn when cut, pushed, pulled, scraped, or sewn together. The unexpected outcomes of delicacy and lightness add to the poignancy of the steel sculptures or the works on paper sewn with metallic threads and beads. And the intimacy within the small drawings vie in contrast to the monumental nature of the installations. SK: What are your upcoming projects? SK: What advice would you give to the upcoming young generation of artists studying in various colleges? AQA: I am often asked to advise young artists and the answer can and often is fairly long. Here I am condensing it to a paragraph. I start by telling them to think long and hard about what they want to do with their lives. There are many choices out there such as making money, gaining recognition or prestige, or owning a business etc. The most important thing to do in my opinion, is to make goals, a few short ones and one or two long-term goals. Planning strategically to figure out how to make the short-term goals further the long-term goals while simultaneously evaluating the artwork one is making to gauge its relevance within the art paradigm is vital. This is often hard for young people as they may not have been taught to think critically. As an artist, it is important to continue to make art, and find opportunities to show one’s work to build a resume. Have a short statement ready when confronted by a critic, art professional or curator without dissolving into a puddle of water. Have a neat packet free of grammatical mistakes ready to send out at a moment’s notice with great images, art statement, and a resume. Always be grateful and smile. Never bad mouth anyone even if they do you wrong as the art world is really small and everything circles back to you. Think of chaos rather than malice as the driving force governing people’s lives. Last but not least, be patient, it will happen eventually, whatever your hopes and dreams are. Work steadily and consistently to make the dream come true.